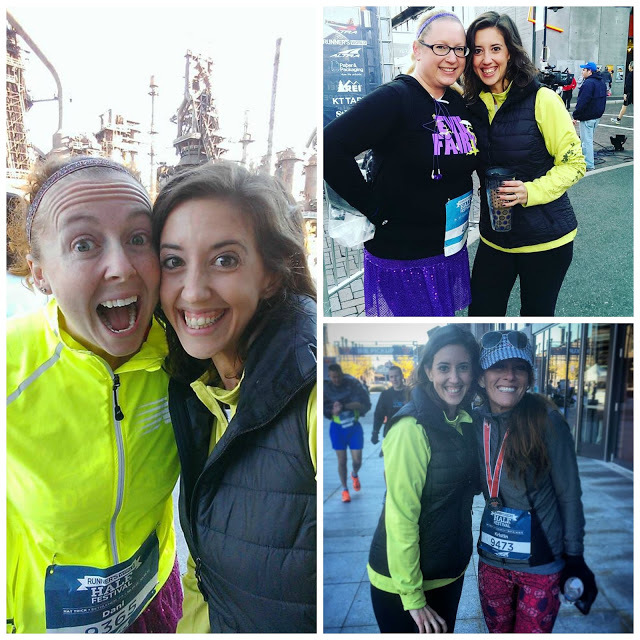 Sparkly Runner: RW Half & Festival: Come Run With Me! The Runner's World Half & Festival holds a very, very special place in my heart. 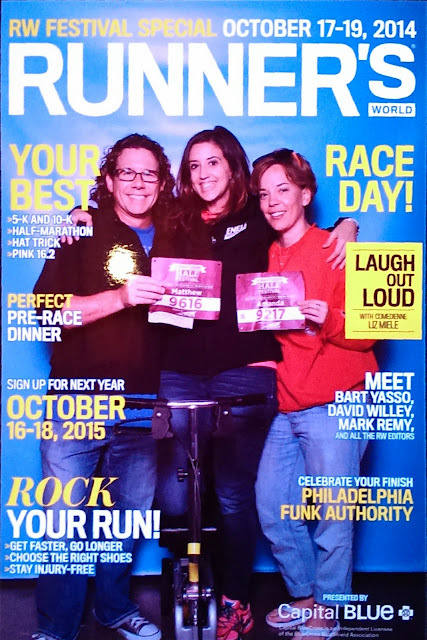 The beautiful city of Bethlehem, the changing leaves and perfect running weather in October, the super cool expo speakers, the opportunity to meet and run with editors from Runner's World... it all adds up to one awesome running weekend. And I had an AWESOME time! Even though I couldn't run, I still got to chat with Runner's World editors/staff, hang out in between races with friends, and just enjoy the atmosphere of a weekend catered to runners of all levels. We met Mandy for the first time this weekend! Then in 2015, I returned to Bethlehem, not to run, but to cheer on several runners/friends that were in town to run the race. The steel stacks are only two hours from my home so I couldn't not make the trip to see Dani (Weight Off My Shoulders), Linzie (Sharp Endurance), Jenna (This Princess Runs For Sparkle) and Kristin (Bama Girl Runs) who had traveled from all over the country/state for the races! So, is it any surprise that I am SO EXCITED to head back to Bethlehem this fall and actually get to run the "Grand Slam" as part of the RW Half & Festival Run Crew?! I literally cannot wait! I'll be running all the races during the weekend (minus the Kids Race and the Dog Run): a 3.8 mile trail race on Friday, 5k and 10k on Saturday, and the half marathon on Sunday. Want to join me for one of the best race weekends on the east coast?? 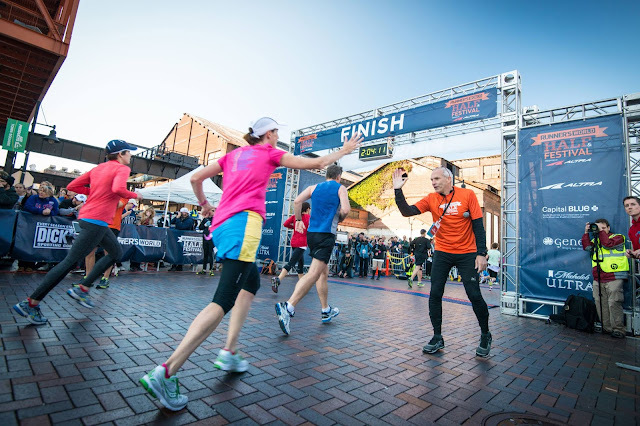 The awesomely generous folks at Runner's World have given me one FREE RACE ENTRY for any of the weekend's events to giveaway to one lucky blog reader! See details below for your chance to win! Giveaway Rules: This giveaway will run until 8/23/17 at midnight. At that time, rafflecopter randomly selects a winner from all the entries. The more points you accumulate, the more entries you can get- make sure to tweet about the giveaway every day to get more chances to win! I will contact the winner on 8/23/17 by email and will give a two day window to respond/claim the prize. If I have not heard from the winner by midnight on 8/25/17, I will draw another name/winner from the rafflecopter list. If you don't happen to win the free entry, you can still get a 10% discount on any of the weekend's races by using the code "SPARKLYRUNNER" at checkout. Good luck and see you in Bethlehem! This weekend has been on my racecation bucket list for a couple of years now. I've always had other races or kids' events right around the RW Weekend. This year might be a squeeze too, I'm gonna check with my wife before I formally enter! I would choose the Half Marathon and maybe add on one of the other events. Just so happens that my kids don't have school that Friday...Bonus! I don't live too far from Bethlehem. I have only been a runner for 4 years. I don't do many races because I can't afford it. I ran my first official half marathon last November. I would love to run another half marathon! Thanks for the opportunity to possibly win an entry! That would be awesome, Tammy! Good luck! This weekend looks like a blast, and this race has been on my bucket list since the first year! Plus... an excuse to see you and Matthew?! Win Win Win!!! PLEASE COME SEE US! :-) Miss you!